My guest today is Mishy Harman, co-founder and host of the radio show/podcast, Israel Story. Joan Brunwasser: Welcome to OpEdNews, Mishy. I'm quite sure that most of our readers have never heard of either you or your show. Let's take care of that right away. Get us started, please. Mishy Harman: Sure, and nice to be here. Thanks for having me. Well, my name is Mishy Harman, and I'm a curly-haired 33-year-old from from Jerusalem, Israel. 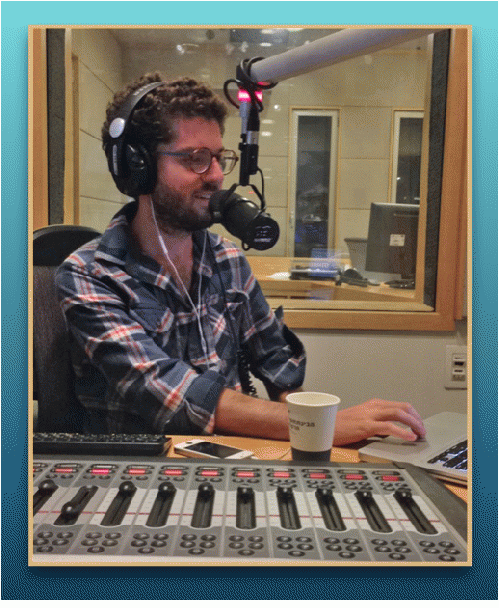 I'm the host of Israel Story which is Israel's leading podcast (and national radio show), in both Hebrew and English. It is often referred to as the 'Israeli This American Life.' Essentially, what we try to do is tell human-interest stories, and move the discussion beyond the usual narratives about Israel being either a place of conflict, settlements and terror or else a "start-up nation" that invented the cherry tomato. (Both those characterizations are - we feel - pretty flat, and fail to capture the richness and diversity that exists here.) But honestly, the best way to learn more about the show is just to download one of our episodes, and take a listen. Other than that, I have a beautiful Vizsla dog named Nomi who recently gave birth to five adorable puppies (one of whom, Golda, I am keeping). I spend an inordinate amount amount of time with my family, whom I love more than anything in the world. JB: Share with our readers how Israel Story came to be. That's a story in and of itself! MH: Of course. It has sort of become part of the mythology of our show by now. So, in 2011, after many years of living and studying abroad, I decided to come back to Israel to begin my PhD. And as some sort of temporary farewell to the States, I bought a blue 2000 Ford Focus station wagon and embarked on a 13,000-mile-long road trip, through 32 states, with Nomi, the dog. As I was about to hit the road, my best friend Roee - who accurately figured that I'd be spending a whole lot of time in the car - downloaded hundreds of episodes of This American Life to my phone. I had never really heard of podcasts before, and had definitely never actually listened to one. So for a while, I ignored Roee's advice that "this will open up a whole new world for you" and instead just took in the scenery, listened to pop music and top-forty stations, and was flabbergasted by certain Christian talk radio shows ("So, Merv, would you call Obama the devil, the anti-Christ or just a plain old Muslim?"). And then, as some point, outside of Vicksburg, Mississippi, I heard my first This American Life episode. It left me so speechless that I had to pull over. It was a combination of intimate and refreshing, poignant, voyeuristic and fascinating. From that moment on, I listened exclusively to the show, catching up on hundreds and hundreds of episodes. I laughed and cried and was able - for the first time - to understand what life looks like from very different vantage points: I heard about the lives of migrant agricultural workers, about the struggles of farmers in Iowa, about deals made by fancy Wall Street brokers, and about daily realities of inner-city African American teens. It was all a real eye opener, and paled in comparison to Israeli radio which consisted, for the most part, of aggressive interviewers yelling at the same handful of tired politicians. So it didn't take me long to figure out that this was going to be my next big project - an Israeli This American Life. MH: I came back to Jerusalem, and got three of my closest childhood friends, Roee Gilron, Shai Satran and Yochai Maital, interested in the project. Together, we decided to go for it. The only problem (which quickly turned out to be no small obstacle) was that none of us knew the first thing about radio or journalism. It took us nearly a year to create the first Hebrew episode, since we had to teach ourselves all the basics: Everything from how to record and edit to how to write for our target audience. We got some great help from Nancy Updike, one of the senior producers of This American Life who was living in Israel at the time. 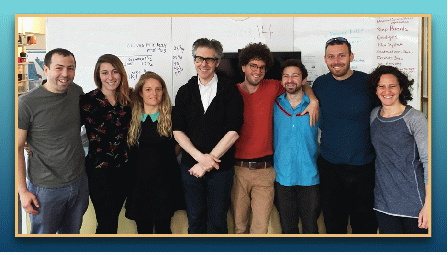 She even introduced us to her boss, Ira Glass, and we learned a lot from observing their process in NYC. The show began as a podcast meant mainly for family and friends. I remember that early on, we said that if it ever got picked up by some local radio station and aired at 3am, it would be really cool, since all kinds of random truck drivers would hear our stories. But then, the show started gaining an audience, and going viral. And soon thereafter, I bumped into the head of Galey Tzahal (Army Radio), which is Israel's largest and most popular national radio station. I told him about our small project, and he was intrigued. A few months later, as if in a dream, we were offered a prime-time slot on national radio. JB: That's really an amazing story! How lucky it was that none of you dwelt on just how much you didn't know and you all jumped in anyway. When your podcast got picked up by Israel's premier radio station, did everyone leave their day jobs and devote all their energies to this show? MH: Oh, no! Not at all. It remained a late-night hobby for all us for quite some time. We always joked and said that our show was what we did between 10pm and 3am. It wasn't until we had completed an entire first season of eleven episodes in Hebrew that we started to think of this as anything more than just a cool side project. That shift coincided with another realization, which I mentioned before, about how Israel was repeatedly represented abroad in this flat, or unidimensional, manner. So we decided to embark on a new project - an English show (or, as my college roommate Brandon called it, "An American version of the Israeli version of 'This American Life'"). That's when Steven Spielberg and his Righteous Persons Foundation made a risky bet on us, and gave us an unbelievably generous grant which enabled us to make it a real job.